What are their roles and when should I use one or the other? The JRE is the Java Runtime Environment. It is a package of everything necessary to run a compiled Java program, including the Java Virtual Machine (JVM), the Java Class Library, the java command, and other infrastructure. However, it cannot be used to create new programs. The JDK is the Java Development Kit, the full-featured SDK for Java. 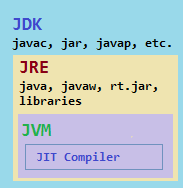 It has everything the JRE has, but also the compiler (javac) and tools (like javadoc and jdb). It is capable of creating and compiling programs. Usually, if you only care about running Java programs on computer you will only install the JRE. It's all you need. On the other hand, if you are planning to do some Java programming, you need to install the JDK instead. Sometimes, even if you are not planning to do any Java development on a computer, you still need the JDK installed. For example, if you are deploying a web application with JSP, you are technically just running Java programs inside the application server. Why would you need the JDK then? Because the application server will convert JSP into Java servlets and needs to use the JDK to compile the servlets. I am sure there are be more examples. The answer above (by Pablo) is very right. This is just additional information. bin/ contains Java's executable programs. The most important is java (and for Windows, javaw as well), which launches the JVM. There are some other utilities here as well, such as keytool and policytool. conf/ holds user-editable configuration files for Java experts to play with. lib/ has a large number of supporting files: some .jars, configuration files, property files, fonts, translations, certs, etc. – all the "trimmings" of Java. The most important is modules, a file that contains the .class files of the Java standard library. At a certain level, the Java standard library needs to call into native code. For this purpose, the JRE contains some .dll (Windows) or .dylib (macOS) or .so (Linux) files under bin/ or lib/ with supporting, system-specific native binary code. bin/ has been enlarged with development tools. The most important of them is javac; others include jar, javadoc and jshell. jmods/, which holds JMOD files for the standard library, has been added. These files allow the standard library to be used with jlink. JDK is a superset of JRE, and contains everything that is in JRE, plus tools such as the compilers and debuggers necessary for developing applets and applications. JRE provides the libraries, the Java Virtual Machine (JVM), and other components to run applets and applications written in the Java programming language. JRE = JVM + Java Packages Classes(like util, math, lang, awt,swing etc)+runtime libraries. JVM = Class loader system + runtime data area + Execution Engine. In other words if you are a Java programmer you will need JDK in your system and this package will include JRE and JVM as well but if you are normal user who like to play online games then you will only need JRE and this package will not have JDK in it. The Java Virtual machine (JVM) is the virtual machine that run the Java bytecodes. The JVM doesn't understand Java source code, that's why you compile your *.java files to obtain *.class files that contain the bytecodes understandable by the JVM. It's also the entity that allows Java to be a "portable language" (write once, run anywhere). Indeed there are specific implementations of the JVM for different systems (Windows, Linux, MacOS, see the wikipedia list..), the aim is that with the same bytecodes they all give the same results. The Java Runtime Environment (JRE) provides the libraries, the Java Virtual Machine, and other components to run applets and applications written in the Java programming language. In addition, two key deployment technologies are part of the JRE: Java Plug-in, which enables applets to run in popular browsers; and Java Web Start, which deploys standalone applications over a network. It is also the foundation for the technologies in the Java 2 Platform, Enterprise Edition (J2EE) for enterprise software development and deployment. The JRE does not contain tools and utilities such as compilers or debuggers for developing applets and applications. The JDK is a superset of the JRE, and contains everything that is in the JRE, plus tools such as the compilers and debuggers necessary for developing applets and applications. Note that Oracle is not the only one to provide JDK. It is an implementation of the Java Virtual Machine* which actually executes Java programs. Java Runtime Environment is a plug-in needed for running java programs. The JRE is smaller than the JDK so it needs less Disk space. It includes the JVM , Core libraries and other additional components to run applications and applets written in Java. It is a bundle of software that you can use to develop Java based applications. Java Development Kit is needed for developing java applications. The JDK needs more Disk space as it contains the JRE along with various development tools. It includes the JRE, set of API classes, Java compiler, Webstart and additional files needed to write Java applets and applications. To debug into Java system classes such as String and ArrayList, you need a special version of the JRE which is compiled with "debug information". The JRE included inside the JDK provides this info, but the regular JRE does not. Regular JRE does not include this info to ensure better performance. Modern compilers do a pretty good job converting your high-level code, with its nicely indented and nested control structures and arbitrarily typed variables into a big pile of bits called machine code (or bytecode in case of Java), the sole purpose of which is to run as fast as possible on the target CPU (virtual CPU of your JVM). Java code gets converted into several machine code instructions. Variables are shoved all over the place – into the stack, into registers, or completely optimized away. Structures and objects don’t even exist in the resulting code – they’re merely an abstraction that gets translated to hard-coded offsets into memory buffers. So how does a debugger know where to stop when you ask it to break at the entry to some function? How does it manage to find what to show you when you ask it for the value of a variable? The answer is – debugging information. Debugging information is generated by the compiler together with the machine code. It is a representation of the relationship between the executable program and the original source code. This information is encoded into a pre-defined format and stored alongside the machine code. Many such formats were invented over the years for different platforms and executable files. JRE is an acronym for Java Runtime Environment.It is used to provide runtime environment.It is the implementation of JVM.It physically exists.It contains set of libraries + other files that JVM uses at runtime. JDK is an acronym for Java Development Kit.It physically exists.It contains JRE + development tools. Usually, when you only care about running Java programs on your browser or computer you will only install JRE. It's all you need. On the other hand, if you are planning to do some Java programming, you will also need JDK. JVM, JRE and JDK are platform dependent because configuration of each OS differs. But, Java is platform independent. Java Virtual Machine (JVM) is a run-time system that executes Java bytecode. 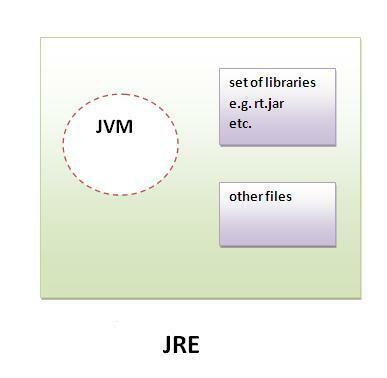 JRE is the environment (standard libraries and JVM) required to run Java applications. The JDK includes the JRE plus command-line development tools such as compilers and debuggers that are necessary or useful for developing applets and applications. The JRE provides the libraries, Java virtual machine, and other components necessary for you to run applets and applications written in the Java programming language. This runtime environment can be redistributed with applications to make them free-standing. Let's called JDK is a kit, which include what are those things need to developed and run java applications. JDK is given as development environment for building applications, component s and applets. It contains everything you need to run Java applications in compiled form. You don't need any libraries and other stuffs. All things you need are compiled. JRE is can not used for development, only used for run the applications. 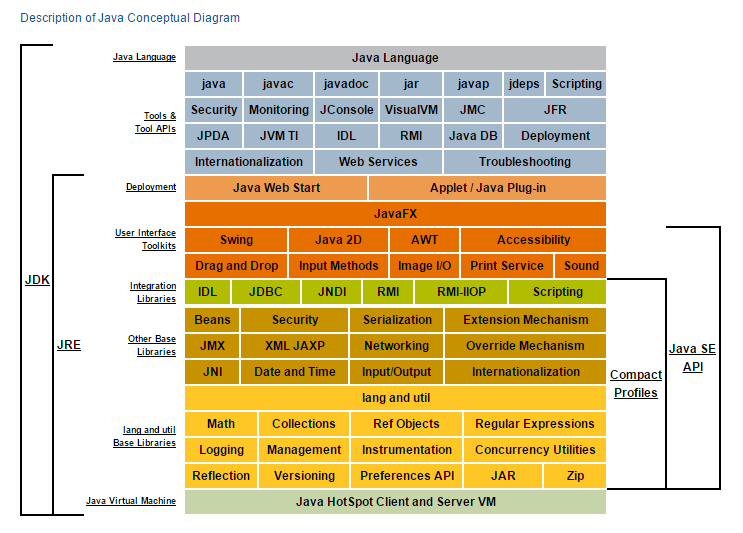 JVM, JRE, JDK - these are all the backbone of Java language. Each components work separately . Jdk and Jre physically exists but Jvm is an abstract machine that means it has not physically exists. JVM is subsystem of JDK and JRE which use to check intermediate code knows as Bytecode. It first load "class file" having .c extension generated by Java compiler (Javac) through JVM subsystem classloader and classified memory location (class area, stack, heap and pc registers) according to there use. Then check all Bytecode to ensure that it is return in java and all memory accessibility access by the network. After that interpretor work start, interpretor check whole program line wise line and finally result shown in console, browser and application through JRE (Java Runtime Environment) which runtime facilities. 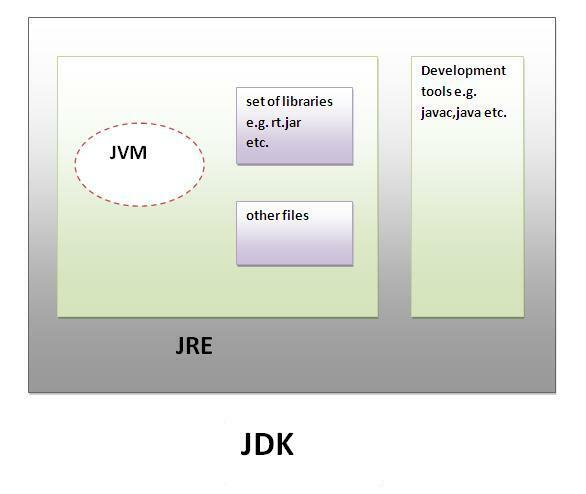 JRE is also a subsystem of JDK which provide runtime facilities like JVM, classes, executable file like .jar file etc. JDK stands Java Development Kit it contain all necessary components which used in programming like class, methods, swing, AWT, package, java (interpretor), javac (compiler), appletviewer(applet application viewer) etc. So final conclusion is it content every file which useful in developing an application weather it standalone or web based. If you are a Java programmer you will need JDK in your system and this package will include JRE and JVM as well but if you are normal user who like to play online games then you will only need JRE and this package will not have JDK in it. JVM (Java Virtual Machine) is an abstract machine. It is a specification that provides runtime environment in which java bytecode can be executed. JVMs are available for many hardware and software platforms. JVM, JRE and JDK are platform dependent because configuration of each OS differs. But, Java is platform independent. A clear understanding of these terms(JVM, JDK, JRE) are essential to grasp their usage and differences. JVM Java Virtual Machine (JVM) is a run-time system that executes Java bytecode. The JVM is like a virtual computer that can execute a set of compiled instructions and manipulate memory locations. When a Java compiler compiles source code, it generates a highly optimized set of instructions called bytecode in a .class file. The JVM interprets these bytecode instructions and converts them to machine-specific code for execution. JDK The Java Development Kit (JDK) is a software development environment that you can use to develop and execute Java applications. It includes the JRE and a set of programming tools, such as a Java compiler, interpreter, appletviewer, and document viewer. The JDK is implemented through the Java SE, Java EE, or Java ME platforms. JRE The Java Runtime Environment (JRE) is a part of the JDK that includes a JVM, core classes, and several libraries that support application development. Though the JRE is available as part of the JDK, you can also download and use it separately. jdk is necessary to compile to code and convert java code to byte codes while jre is necessary for executing the byte codes. JDK includes the JRE plus command-line development tools such as compilers and debuggers that are necessary or useful for developing applets and applications. JRE is basically the Java Virtual Machine where your Java programs run on. It also includes browser plugins for Applet execution. JDK is an abstract machine. It is a specification that provides runtime environment in which java bytecode can be executed. So, Basically JVM < JRE < JDK as per @Jaimin Patel said. The difference between JDK and JRE is that JDK is the software development kit for java while JRE is the place where you run your programs. suppose, if you are a developer then your role is to develop program as well as to execute the program. so you must have environment for developing and executing, which is provided by JDK. suppose, if you are a client then you don't have to worry about developing.Just you need is, an environment to run program and get result only, which is provided by JRE. JRE executes the application but JVM reads the instructions line by line so it's interpreter. JRE is an acronym for Java Runtime Environment.It is used to provide runtime environment.It is the implementation of JVM. It physically exists. It contains set of libraries + other files that JVM uses at runtime. Implementation of JVMs are also actively released by other companies besides Sun Micro Systems. what is the difference between jre in jdk and jre 7? What is the need of JRE even though JDK contains JRE? While deploying any web-app,What is the Role of JDK in application servers? What is the difference between JVM, JDK, JRE & OpenJDK?